This hybrid class is gaining popularity. 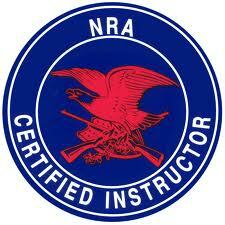 Phase 1 is completed online and Phase 2 in person with the instructor at the range. More details below. The NRA Basic Pistol Course was developed to teach the basic knowledge, skills and attitude necessary for owning and using a pistol safely. Until May 15, 2016, this course was entirely instructor taught but now requires completion of 11 online lessons prior to the instructor led portion of the course and has a new minimum shooting proficiency requirement. You must be a U.S. Citizen or a U.S. Person – a natural person who is a lawful permanent resident as defined in 8 U.S.C. 1101(a)(20) or who is a protected individual as defined by 8 U.S.C. 1324b(a)(3) to participate in this course. This phase is taken and completed online. You can take the course at any time, 24/7 from any computer using your log-in and password. If you exit the course before completing it, when you return you can pick up where you left off. This course is comprised of instructional screens combined with audio narration that serves as the voice of the instructor. This part of the course will be conducted in-person with our NYC instructor and is comprised of both classroom instruction and a shooting requirement. You are eligible to attend Phase II after successful completion of Phase I. The instructor led portion of the course, Phase II, which will also involve shooting, will be scheduled at least once a month for those who have successfully completed Phase I. Enrollment is limited and classes can fill up. All the materials for this course are electronic and are saved in the Adobe PDF file format. If you do not have the Adobe PDF files reader go to: http://get.adobe.com/reader/. Once you start the program you will be directed where to easily locate all of your materials for this course. The cost of the course materials are part of the course fee and are not extra. You must complete all eleven lessons and a final exam with a 90% pass rate in order to get certified as having completed Phase 1 of your training. If you do not pass the exam the first time you will be provided with two additional opportunities to take the exam. Once you pass the exam you will be directed to generate a completion certificate that you can save as a file and/or print. You will then be ready to take the instructor led Phase II of the course. You will have access to this program for 90 days from the start of your enrollment date after which access expires. Price: $210 is the TOTAL cost for BOTH Phase I (on-line) and Phase II (instructor led in-person class). If shooting in NYC for Phase 2 (NYPD handgun license required), there will be no additional range fee and will include 1 box (50 rounds) of ammunition, otherwise there will be a $30 fee to shoot in NJ. Shooting will include 1 hour of range time, ear and eye protection, insurance, targets, and 1 box (50 rounds) of ammunition. The course calls for 200 rounds of ammunition so you may be responsible for bringing/purchasing ammunition. If you need multiple attempts to complete the Red Level qualification or you would like to achieve the Blue, White, or Instructor endorsements, you may need to purchase additional ammunition from the range. Refund Policy: This course is non-refundable.